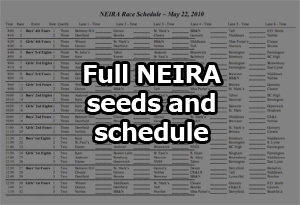 The racing season culminates every year with the New England Interscholastic Rowing Association Championship Regatta, otherwise known as NEIRAs. The top three boats from the boys and girls squads will return to Lake Quinsigamond in Worcester, Massachusetts to race against dozens of other schools. The 1500 meter racecourse begins near the Donahue Rowing Center to the north and ends in front of Quinsigamond State Park to the south. Boats will race once during the morning heats and again during the afternoon finals. The second and third eights must place in the top three of their six-boat heats to proceed to the grand final, while the first eights must place in the top two for the grand final. The lane assignments in the heats are determined by that boat’s record throughout the regular season. The below table lists each boat’s record this season, its seed, lane assignment, heat time, and presumptive grand final time. In addition to the gold, silver and bronze medals awarded to each of the top three boats in the finals, a number of ceremonial trophies are awarded on an annual basis to the winning crews. The Father Frederick H. Sill Bowl and Dixon “Tote” Walker Cup are awarded to the boys first and second eights respectively, as well as the Kenneth F. Burns Trophy and Converse Prudden Prize to the girls first and second eights respectively. In addition to the medals and ceremonial event trophies, the Hart Perry Cup and Gilcreast Bowl are awarded to the programs which earned the most points in the boys and girls eights events respectively. Points are awarded based on the place in which each boat finishes in its event–with more points alloted from more competitive events. Crews will launch from Quinsigamond State Park near the finish line. Click here for directions. Lane 1 is to the west closer to Worcester, Lane 6 is to the east closer to Shrewsbury. Parking is limited along Lake Avenue and not allowed in the Quinsigamond State Park lot. However, plenty of parking is available only a few minutes West at the University of Massachusetts Medical School guest parking lot. All day parking costs $4. The entrance fee for the regatta is $5. Included with entrance fee is an official regatta program. A printable results sheet is available for download here. 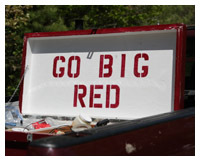 Additional rowing merchandise and memorabilia will be available from vendors at the regatta. Best of luck to all crews!